2013 was a great year for me crochet-wise. I met some of my 2013 goals and completed a 6 pound stash bust challenge. Crochet by Darleen Hopkins on Facebook is establishing a cozy community (come join us! ), Pinterest is up and running and even a monthly Newsletter (Feelin’ Loopy) is getting ready for its second issue. So what is there to accomplish in Crochetland for 2014? LOTS!! A few of my top goals or to-do’s for 2014 are listed below. The Super Stitcher in me is determined to complete them all. 1) Complete the Crochet Guild of America’s Master Crochet Program. I’ve signed up and received the materials, now it is time to start stitching. 2) Work from yarn stash and only purchase yarn when absolutely necessary for a specific project; don’t buy yarn just because it’s on sale! This is ongoing. I started it in 2013 and plan to continue until I can get this huge stash under control! 3) Stash Bust for Hope Challenge 2014. This is my favorite goal. Last year I crocheted 6 pounds of Bernat CottonTots into soft hats for Halos of Hope. In addition to the 32 hats completed in that challenge, I also crocheted many other hats for Halos of Hope that were made from other stash yarns. So this year I challenge myself to crochet 7 POUNDS of my stash yarn into soft hats for Halos of Hope stitching at least 2 hats a month and, like last year, post photos and report on the total stitched yarn weight. 4) Continue to work on left-handed crocheting. Every once in a while I give this a try. I’m not there yet but I’d like to be comfortable enough using my left hand so I may be able to one day teach a lefty. 2013 flew by in what seemed like a nanosecond. The years are going faster and faster and sometimes I feel like my hooks can’t keep up, but I’m going to try. What are your crochet goals for 2014? 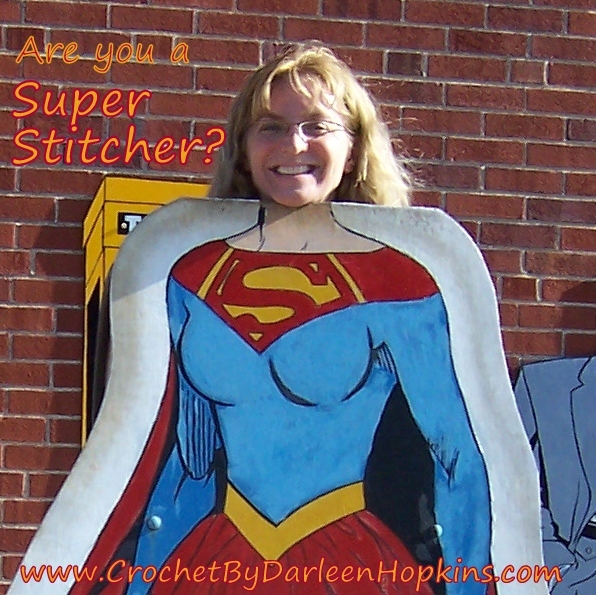 Be a Super Stitcher too and have fun with whatever you make. Last, enjoy all the new year has to offer. This entry was posted in 2014 Chemo Hat Challenge, General Interest and tagged CGOA, charity, chemo, crochet, Crochet Guild of America, Halos of Hope, knit, resolutions, stash bust, stash busting, yarn. Bookmark the permalink. ← Stash Busting for Hope – Challenge Update and ALMOST DONE!